Blim returns to the Main Street area with over 45 different vendors such as fashion, accessories, fine art, vintage, crafts, and food, as well as live music and entertainment. 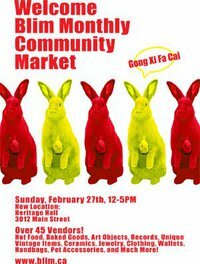 The monthly market takes place on the last Sunday of each month at the Heritage Hall from February to May and the Chinese Cultural Centre in the Fall / Winter. Plan ahead with our Around Town craft fair listings! here is the fb event for more vendor details.